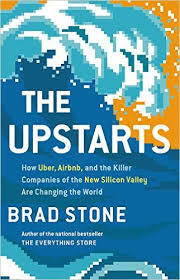 The Upstarts by Brad Stone was an interesting book on Uber and Airbnb, two still privately held companies that in the past decade have become behemoths in their respective spaces. Stone is a Businessweek writer who also previously wrote The Everything Store: Jeff Bezos and the Age of Amazon and while having The Upstarts be on two companies felt at times to make it harder as a reader to get a consistent flow from the book than was the case with that on Amazon, it also made sense to include both as Uber and Airbnb very much linked in their dual reliance on sharing economies and similar paths to success. Stone details very well the founding stories of each company, with Airbnb from CEO Brian Chesky, Joe Gebbia, and Nathan Blecharczyk, and how they early got attention Selling Obama O's and Cap'n McCains cereal around the 2008 Presidential election. This helped them get into the Y Combinator startup school in Silicon Valley as the story and mental toughness it showed impressed Paul Graham, the program's co-founder who told them "you guys are like cockroaches, you just won't die." Uber was started by Garrett Camp, who made money from founding StumbleUpon then became interested in the idea of transportation and the woeful taxi industry in San Francisco, and Ryan Graves and now CEO Travis Kalanick joined early on. The company started out with licensed town cars delivering a premium service and then moved from being about luxury to more about time and convenience. Price also is an interesting factor around Uber's growth, with how Uber would utilize dynamic customer pricing to entice more drivers. Stone wrote that while Chesky as CEO of Airbnb known as having a less publicly adversarial approach than Kalanick, both are fiercely competitive leaders and two huge factors leading to the success of each company have been fund raising and public demand. Each has raised huge amounts of money and it was interesting reading of how initial investments made by people would get diluted through later fund raising. In terms of public demand, especially Uber found footing through the sheer force of people wanting the service and the success of each company has been in part from building momentum and public will to overcome legal hurdles. The story of Airbnb and Uber up to present day is a fascinating one well told by Stone and makes me think back to writing that I did on each years ago, with a May 2011 post on a Fast Company Sharing Economy piece on Airbnb and other firms and an April 2012 post on an interview with early Uber investor Chris Sacca that noted the hustle of Ryan Graves.